Villa Phaelyn is a majestic paradise located just metres from the glorious white sand beaches of Mae Nam. Perfect for weddings or events, the seven-bedroom villa comes with a gym, private pool and many lounge areas for socialising and relaxing. Crossing through the double timber gates and past the sparkling lotus pond in the entrance hall, you will enter the vast marble-panelled living space, centrally located in the villa, with a huge sofa in front of the flat-screen TV, with beautiful teak flooring underfoot. A modern, fully-equipped kitchen offers the perfect place to rustle up a Thai delight, be it a light snack or a full banquet – but don't worry if you'd instead not as our on-site chef will be happy to prepare all your meals! There is a dining table for fourteen at the far end of the living area, and large patio doors at the other, opening out onto the enchanting garden space. There are seven lovely main bedrooms, with king-size beds, or two massive singles, full-length walls of patio doors, a dressing room, sofas, TVs, fridges and breath-taking ensuite facilities, while the master-suite enjoys sea-views. Light wood and marble create soothing tones throughout each room, complemented by an array of soft lighting and powerful yet tasteful decor. The luxurious bathrooms have a variety of large walk-in, outdoor showers, sunken bathtubs with hydro-massage jets and double vanity units. An extra children's room consists of three sets of bunk beds, a large TV, Nintendo Wii console and beanbags, creating the perfect space for them to entertain themselves and leave the adults with a little time to relax. Even with such remarkable interiors, we bet you'll be spending most of your time on the terrace! A fantastic veranda space enveloped in a luscious lawn, with comfortable sofas and chairs around a coffee table creates the perfect space to enjoy a glass of wine while admiring the sunset over the sea. The row of palm trees, the glassy surface of the huge private pool and the ambient lighting make for an extraordinary experience. Make the most of the surreal environment with an alfresco meal at the long table by the pool, with space for fourteen alongside the top of the range barbecue equipment, a bar with a large fridge and surround sound speakers. Our staff, including a personal villa manager, chefs and maids, will ensure you enjoy maximum comfort, along with 24-hour security. 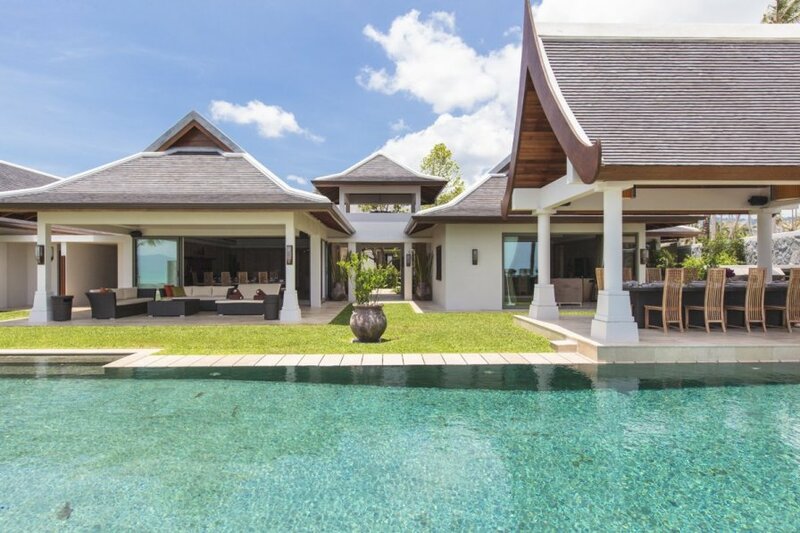 Villa Phaelyn is located on the tranquil Mae Nam beach, a five-kilometre stretch of palm-lined, pristine white sand famous for its glorious sunsets.